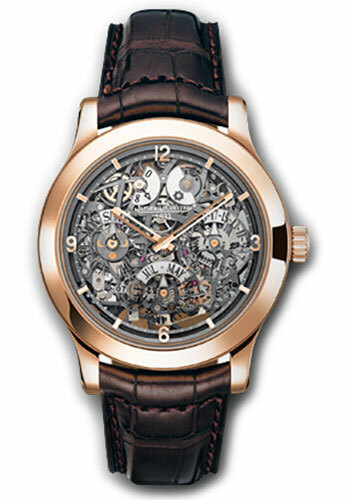 18K pink gold case, ruthenium dial with gilt numerals and hour-markers, hand-winding calibre 876SQ movement with day/night indicator, moon phases, power-reserve, perpetual calendar, date, day, month, year, approximately 8 days of power reserve, alligator leather strap with double folding buckle. Water resistant to 50 meters. Platinum case, skeletoned dial with appliqued numerals, hand-winding calibre 876SQ movement with perpetual calendar, moon phases, day/night indicator, power-reserve, red security zone, approximately 8 days of power reserve, alligator leather strap with double folding buckle. Water resistant to 50 meters.